Imagine for a moment that you did not know what happiness felt like. Imagine that you were then told the only way to truly experience happiness was to eat a certain type of food. Now this magical food will not make happiness last. Nope, it just gives you a taste. Would you want to eat it? Would you want that taste? That’s what life is like for the Bergens. The Bergens are the “bad guys” in DreamWorks Trolls. They want to eat the Trolls so that they can get a taste of the happiness the Trolls seem to have. I don’t think they’re really bad guys. Now Chef? Chef might be a true villain but you’ll have to see the movie to find out why. I really like that even though we are meant to root for the Trolls throughout the film we are not meant to dislike the Bergens. We want to see them win too. We want them to find happiness…just not by eating the trolls. The animation in this film is WONDERFUL. The colors are so vivid and everything just looks great. The partnership of Branch and Princess Poppy is so cute. I’m a fan of banter and their banter is adorable. This is a movie that’s fun for the whole family. The music will have you dancing in your seat. 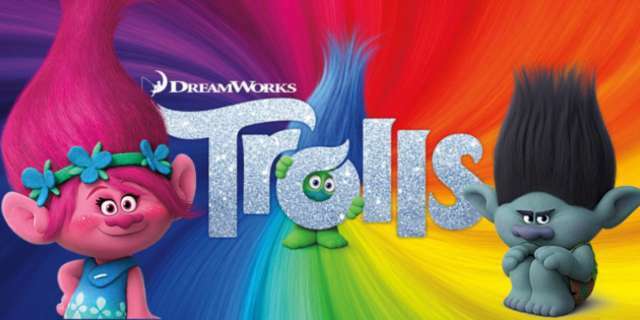 Children will enjoy the silliness of a certain Troll sneezing and farting glitter! Adults will appreciate the life lessons that they can discuss with their littles after the movie. What is true happiness? Where does it come from? While most of it is singing and dancing (and trying not to be eaten) the movie also includes betrayal, doubt and loss. These darker topics do not take the lead and our smaller littles might overlook them completely but I think they can be good conversation starters. Before I wasn’t sure if I was going to see this, but now I KNOW I am going to see this.